Sayu begins by talking about Morning Musume’s recent Mezamashi Live performance. During the event, they performed her debut song “Shabondama,” exactly 11 years to the day after it was first released. Sayu says she felt really nervous about it — so much so, in fact, that she says the nervousness mixed with the heat nearly made her feel physically ill.
Song: Berryz Koubou – Tomodachi wa Tomodachi nan da! Fan mail #1: As is the trend lately, the listener asks how Sayu reacted to the news of Berryz Koubou’s upcoming indefinite hiatus. Sayu was of course surprised when she heard the news. She says that while some might think that the members of Berryz might not really be all that close behind the scenes due to their varied personalities and characters, she assures the listeners that that is not at all the case: even after ten-plus years together, they’re always seen hanging out together, and Sayu suggests that they must have really deep connections with each other. Sayu says she feels a mix of surprise as well as loneliness — Berryz Koubou has existed for nearly the entire time Sayu has been a member of Morning Musume, so them being there has always felt like an unchanging constant for her. To think that they won’t be there anymore after next spring feels really strange and unimaginable to Sayu. “What will Hello!Con without Berryz look like?“, she wonders aloud. Lately, Sayu says she has especially felt the power of the group when listening to their song “Ai wa Itsumo Kimi no Naka ni.” She says that it’s such a cool, powerful song that it could only have been released by Berryz — and not Berryz two or five years from now, but the Berryz of right now. Sayu calls the song just amazing. Berryz have often been called “intense” or the “scary senpai” of H!P, but Sayu says this song takes it to a whole new dimension. She says she has been feeling this way ever since seeing them do the song in rehearsal, and looking back, she speculates that it may have been the result of them having talked about their hiatus and thus strengthening their unity. Berryz has lots of songs that Sayu loves just as much as this one, and while it’s not like the songs themselves will disappear as you can still listen to them on CD and probably hear others perform them in H!P concerts, she does feel lonely that there probably won’t be many opportunities to hear the songs sung by Berryz themselves after next spring. Sayu says she’s looking forward to the remainder of Berryz’ activities together as a group. Sayu says she actually worked quite hard at her studies back in elementary school, and that she especially liked arithmetics and always got good grades in tests. Sayu is confident she’d get the highest score if it was just arithmetics — the only thing she asks is that she’d get to study for it the previous night. But subjects like Japanese language, history and especially social studies she says she would have trouble with since it’s all stuff you have to memorize, and memorizing is something she’s no good at. But even so, she doesn’t think she’d get the lowest score. Sayu claims she’d probably rank somewhere in the middle, with the lowest score of course going either to Maa-chan or… nope, just Maa-chan. Ikuta — although she might seem like an airhead — Sayu thinks actually seems quite serious about her studies, and she’s never once considered her a fool. Harunan, on the other hand, reads lots of manga and Sayu says that might in fact really help her with recognizing kanji. Sayu predicts that the girls who’d have the most trouble would perhaps surprisingly be the girls who have been out of elementary school the longest: herself, Ishida and Fuku-chan might be in the biggest trouble. Fan mail #3: The listener says the first thing they do after getting back home from school is always to look in the refrigerator, and it’s not that they’re hungry or thirsty: they just want to see the contents. They ask if Sayu has anything similar she must do immediately after getting home. Sayu definitely gets the “wanting to look in the refrigerator” thing: there’s the excitement after having been at work the entire day of what if her mom has saved some leftover dinner for her, or bought her some sweets or something. 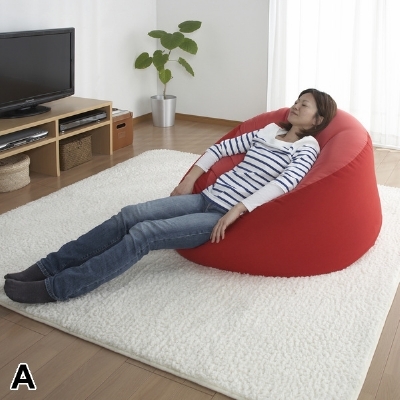 But for Sayu, the very first thing she does is throw herself on a bean bag chair they have at home and get comfortable. Sayu says she loves how the material gets molded exactly into your body shape, and it becomes almost impossible to get out. She does everything while laying on that cushion: updating her blog, watching TV, just relaxing… everything. She says it’s pretty much her personal territory. In this segment, listeners send in dajare wordplays and Sayu decides if they’re funny or not. Fan mail #4: The listener talks about having seen Sayu on the TV program “Sekai Fushigi Hakken!” (aired earlier in August). He says he can’t stand insects and thus he had trouble even just watching the show on TV, so he wonders if Sayu was okay having to witness such huge larvae live in the studio. I dont think she is dumb, I think she has adhd or something. It is harder for her to learn. great, i was just rewatching those mechaike. funny graduated members… i miss them though i wasn’t yet aware of momusu when they were still part of it. > “What will Hello!Con without Berryz look like?“, she wonders aloud. Those bean bag things are really comfy. Dajare are great. I need to further expand my active vocabulary, so I can become better at making up my own. After all, I’m slowly but steadily closing in on oyaji age. > “a container for lemons” — oh man, what a knee-slapper! I ignored the insect sitting on my wall, but later I crushed it to kill time. …Lame, but I can’t do any better at this time of the day.